If you could change careers, what would you do instead? Write about what your new job/life would look like. If you could live in a foreign country, where would you choose? Imagine where you would be, and write about your life there, in as much detail as possible. 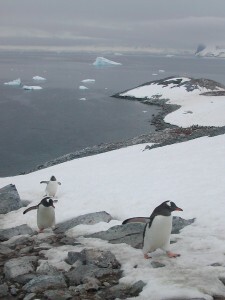 When I visited Antarctica more than 10 years ago, I met researchers from Oceanites, a nonprofit foundation founded in 1987 whose main focus is its Antarctic Site Inventory, which has been collecting and compiling data on penguins and their habitat in the Antarctic peninsula for the past two decades. When I wrote the short story “The Ecstatic Cry” and later MY LAST CONTINENT, I had a similar fictional organization in mind for the researchers in these stories. …and it goes without saying we need to protect their habitat by taking better care of our planet and the oceans that sustain them. Check out Oceanites to learn more , and click here for info on the film The Penguin Counters, inspired by Oceanites founder Ron Naveen. Write about a favorite plant, flower, or tree. 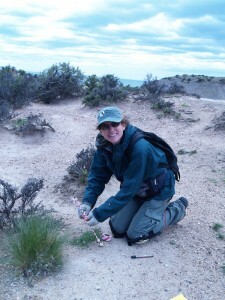 Go beyond writing about the plant itself and write about your first memory of it, then a more recent memory. Create a scene based on one of these memories. I just read this recent article by Amanda Biederman — a scientist stationed at the U.S.’s Palmer Station, located on the Antarctic peninsula — who writes about being at once removed from the media’s coverage of climate change, yet also being at ground zero at the same time. Biederman writes about the scary news from NASA about the imminent disappearance of the Larsen B ice shelf, as well as the fact that on the other side of the continent, in East Antarctica, while there had been increases in ice shelf volume between 1994 and 2003, this part of the continent is also experiencing ice shelf loss at the rate of 56 cubic kilometers per year. If the entire Antarctic ice sheet melted, global sea levels would rise by 60 meters. Much of the U.S. East Coast — including about one-third of Maryland and the entire state of Delaware — would be underwater. Denmark and the Netherlands would disappear. Large portions of other countries, including the U.K., China and Brazil, would be destroyed as well. It’s so easy to think of Antarctica as a faraway place, where what happens there doesn’t affect the way we live. But it does…and it will even more over time. Write about a jelly bean flavor that should exist but doesn’t. Today I’m delighted to share a writing prompt from author Jennifer Caloyeras, whose YA novel Strays was just released by Ashland Creek Press. Jennifer did a residency at the blog Novel Novice, which included classroom material (i.e., this prompt, as well as a few great action items). Write about a memorable interaction with an animal. (Off the top of my head I can think of a bird’s nest filled with eggs that I claimed and the mother bird came back looking for her babies. Or the time I saw a rattlesnake on a hike and instead of being afraid I was in awe of its beauty.) Describe the animal using all five senses. How did this interaction make you feel? What did you learn from the experience? The more details you can add the better! Why not throw a metaphor or simile in there? What do you think the animal was thinking? In what ways were you similar to that animal? In what ways were you different? While this may be aimed toward YA readers, I love this prompt, as I think we all should consider our relationship to animals, whether our pets or the wildlife that surrounds us. Just this last week, for example, I saw a bear coming down the driveway toward a major road as I drove by; my husband and I trapped an injured bird and took it to a wildlife rehab center; and I helped care for a range of feral, sick, and adoptable cats at the animal shelter. Such human-animal interactions are becoming more and more inevitable. In fact, for insights into animal life on the urban edge, and to learn about the wonderful people who help rehabilitate animals harmed by life on this edge, check out the series Animal R&R, written and directed by Elliott Kennerson and narrated by Joan Embery, which you can watch online (and click here to follow the series on Facebook). The Larsen B Ice Shelf has been in the news recently due to a recent NASA report about the shelf’s increasing fragmentation, including visible cracks. This is alarming news, as the breakup of the remainder of this ice shelf — which could happen within the next five years — would cause a massive rise in sea levels globally. While the United Nations projected the planet could see a rise in sea level of up to three feet by the year 2100, due to human-induced climate change, this study did not take into account the potential loss of Larsen B. Global warming has been increasing faster at the planet’s poles than elsewhere on the planet. The Antarctic peninsula alone is nearly 5 degrees warmer than it was 50 years ago — an astonishing increase in temperature. The big danger in losing the Larsen Ice Shelf is that it holds three of the continent’s glaciers in place. With the ice shelf gone, the glaciers will advance into the ocean; it’s this loss of ice that will cause the rise global sea levels. The Larsen Ice Shelf has existed for 11,000 or 12,000 years, says lead researcher Ala Khazendar in this video, below. After a large part of the shelf broke off in 2002, it has been weakening quickly and is not expected to last more than a few more years. Without a doubt, he says, this will affect sea level rise. If you had to move (for a job, for example, or for a partner’s job) but could choose the place, where would you go? Write about what would be similar and different — urban v. rural, big city v. small town, mansion v. condo. Create a scene with yourself and your family living in this new environment. Writers: The Siskiyou Prize is open for submissions! If you’re working on a book with environmental or animal-protection themes, Ashland Creek Press has the contest for you. The Siskiyou Prize is awarded by Ashland Creek Press for an unpublished, book-length work of prose with environmental themes. The deadline is September 1. The winner receives $1,000; a four-week residency at PLAYA; and an offer of publication by Ashland Creek Press. The 2015 prize will be judged by award-winning author Ann Pancake (author of the phenomenal novel Strange As This Weather Has Been and the brand-new story collection Me and My Daddy Listen to Bob Marley). Click here to learn about last year’s winner, Mary Heather Noble, selected by bestselling author Karen Joy Fowler, whose novel We Are All Completely Beside Ourselves won the 2014 PEN/Faulkner Award and the 2014 California Book Award and was shortlisted for the Man Booker Prize. For complete details and to submit, visit SiskiyouPrize.com or AshlandCreekPress.com. I came across two very different glimpses of Antarctica recently — one terrifying, and the other gorgeous. Of course, they’re connected…the first (NASA images of a gigantic iceberg breaking off a glacier) is a strong warning that we need to do something about climate change before what we see in the second (stunning video captured by a drone) disappears altogether. This graphic is amazing because NASA captured imagery of the iceberg splitting from the continent just before and just after. It may look small in this image, but remember, this was shot from space! The iceberg, which broke off of West Antarctica’s Getz ice shelf, is 17 miles long (larger than Manhattan) and only one of many that have been breaking off the continent’s glaciers and floating into the sea (which will cause the oceans to rise to catastrophic levels). Check out the article for more info and photos. And this gorgeous film was made by a Swedish filmmaker visiting Antarctica during this last tourist season … it shows the continent it all its quiet beauty, and in a few of the images you can see just how tiny human life feels in this vast place. Below is one of the stills from Kalle Ljung’s film … definitely worth watching, especially if you need a few moments of peace — it’s very meditative. 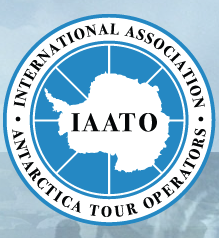 The International Association of Antarctica Tour Operators (IAATO) is a voluntary membership organization founded in 1991 to help Antarctic tourism keep up the standards of the Antarctic Treaty, that is: to protect the environment and to keep developing guidelines to continue to preserve and protect the continent. Recently, IAATO released its latest tourism numbers, and I always find it interesting to gauge the activity in this part of the world. 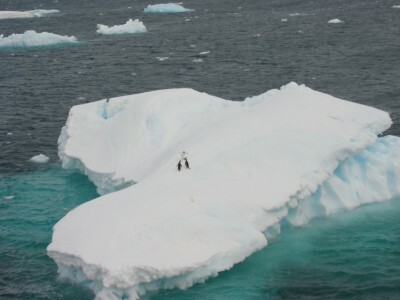 The total numbers of visitors traveling to Antarctica (with IAATO members) was 36,702. This is 2 percent less than the previous season; the highest recorded number of tourists visiting the continent was 46,265 during the 2007-2008 season. IAATO also estimated the numbers of visitors expected next season, 2015-2016, and this edges closer to that high number: 40,029. The organization expects this increase to be among those smaller cruise ships that do landings, which means safer travel yet more feet on the ground in Antarctica. This past season, 73 percent of Antarctic visitors traveled on small ships carrying fewer than 500 passengers — yet it’s the 26 percent of visitors who cruise through on larger ships without making landings that can be even more dangerous. These ships often carry thousands of passengers, and when you get into trouble that far south, rescues are challenging. In 2007, a Canadian ship struck underwater ice in the waters off the Antarctic peninsula and sank within 15 hours. Fortunately, the ship had only 91 passengers, all of whom got into lifeboats and received help from a Norwegian ship that was nearby. In addition, the weather was good, around 20 degrees Fahrenheit (fairly balmy for Antarctica) and calm. But what if there had been hundreds more passengers, or if the weather had turned, or if no other ships were close by? This is one of the questions that MY LAST CONTINENT tackles. Traveling to Antarctica comes with inherent risk — it is, by nature, a wild and unpredictable place — and IAATO continues to keep the safety and environmental standards as high as possible. By now, most ships that travel to Antarctica are IAATO members, which wasn’t always the case. But with tens of thousands of tourists visiting annually, and this number only increasing, the continent is bound to be affected. My hope is that visitors return with a new respect for the planet and for all that we need to do to keep it healthy, and to keep Antarctica icy. Of course, many believe we shouldn’t visit at all … like John Oliver, who has created a hilarious (anti) travel campaign for the white continent. Write about a former love. What would your life be like now if you were still together? In what ways would it be similar, and in what ways totally different? 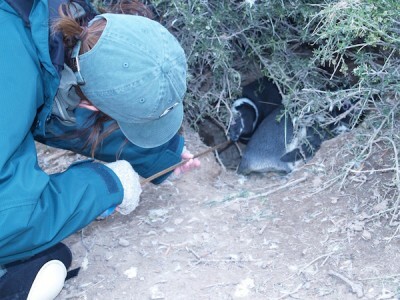 While these days, I can only count penguins via Penguin Watch, several years ago I was fortunate to have been able to help count penguins at Punta Tombo, in the Chubut Province of Argentina (one of the settings in MY LAST CONTINENT) with the University of Washington’s Center for Penguins as Ocean Sentinels. This was in 2006, and back then it had been about 15 years since the previous census. 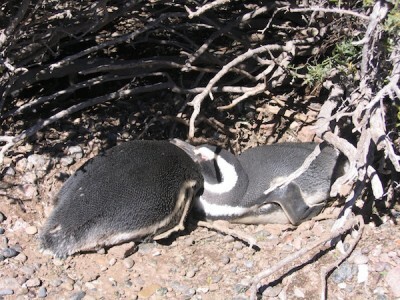 A small group of volunteers, we counted all the penguins in 731 circles (in teams of two, we counted all the nests, birds, and eggs within five-meter circles spaced about twenty meters apart) and discovered that there were 155,000 nesting pairs at Punta Tombo. This colony has been studied for about 30 years, and unfortunately, the number of active nests at Punta Tombo has decreased by about 1 percent each year. Reproduction was better than average this past season, but there were fewer active nests, which means fewer chicks fledged than in most years. The main cause of chick death was, as usual, starvation — due to overfishing, penguins have trouble finding food close to the colony, and when they have to go farther for food, it’s more likely they won’t make it back in time to feed their hungry chicks. 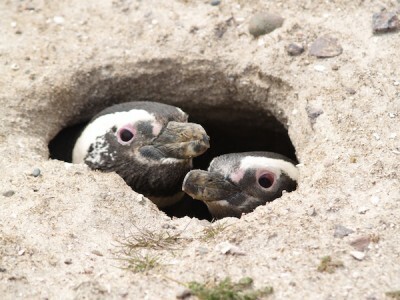 Climate change has also affected the penguins — one rainstorm this season killed 3% of the chicks from a 100-nest area. Like these two lovebirds nesting above, many penguins mate for life — and the research being done will help us figure out how best to help them survive on the long term. Learn more — and find out how to help keep this important research going — at the Center for Penguins as Ocean Sentinels. When I was writing MY LAST CONTINENT, I did a lot of research on penguins and those who study them. Then, a couple of months ago, I discovered Penguin Watch, which is a completely addictive website that uses citizen science to help study penguins. What this means is that we can all take part in the research and conservation of these amazing animals. How does it all work? The short of it is that the Penguin Lifelines project at the University of Oxford has set up a camera-monitoring program of 50 cameras set up throughout the Southern Ocean and along the Antarctic Peninsula. These cameras snap images of the areas overlooking colonies of gentoo, chinstrap, Adélie, and king penguins year-round, and they need volunteers to help annotate the hundreds of thousands of images being produced. For more info, click here — and sign up! Penguin colonies are difficult to access during breeding season, but thanks to time-lapse cameras and online volunteers, the Penguin Watch program hopes to make big strides in conservation and protection. Visit Penguin Watch and become a citizen scientist. It’s tons of fun, but be warned — you’ll lose hours to penguin counting! But at least you can say you’re doing it for science.